1) Pour the quinoa into a large bowl. 2) Grate the carrots and thinly slice the spring onion. Chop the red capsicum and mint leaves. 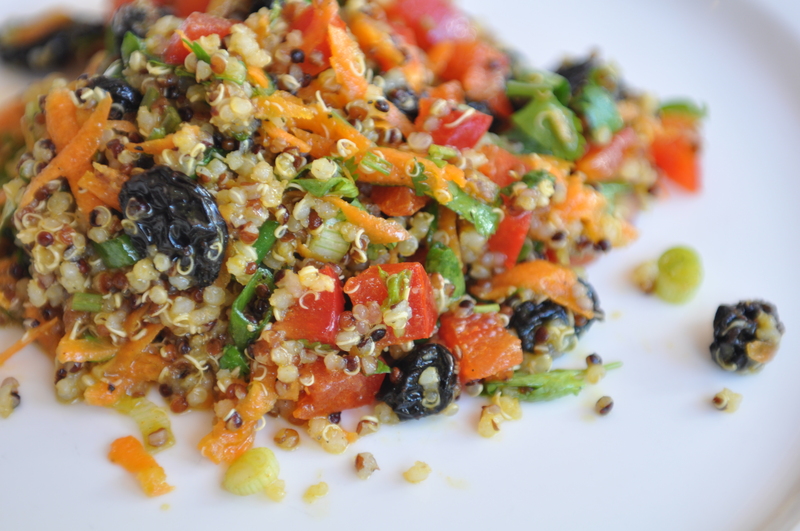 3) Add the carrots, spring onion, red capsicum, raisins, turmeric and mint leaves into the bowl with the chilled quinoa. 4) Next make the dressing. Start by adding juice of the lemon into a bowl. 5) Add the honey, sesame oil, olive oil and turmeric and mix well. 6) Pour the dressing over salad and toss well. 7) Season to taste with a pinch of salt and black pepper to your taste.